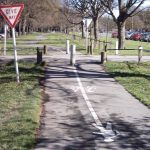 Christchurch’s first step into the brave new world of cycleways came almost accidentally with the reconstruction of Ilam Road near the University. What started out primarily as a pedestrian crossing improvement project ended up also providing some rather handy separated cycle facilities as well. It has not been without its controversies however and the City Council are keen to learn what they can from it as they move forward to delivering major cycleways across the city. So much activity – does it all work? With that in mind, I’ve been fortunate to be involved in an exercise auditing the Ilam Road project. This is looking at the safety, operational, and construction/maintenance aspects of this project, with a view to identifying some lessons learned for the future Major Cycleway projects around the city. Given that many of the facility types being planned for Christchurch are relatively new for the city (let alone NZ), it’s important that a consistent process is developed for implementing these with some uniformity and without major drama. Clearly a lot of interest (and angst) has been on the concrete kerb separators used along the road. There are a range of potential separator options that have been tried around the world, as noted previously. The separators here have been noticeable by their relatively inconspicuous appearance (if you’re not looking for them) and distinctly unforgiving nature if you hit one (which has clearly happened quite regularly). I actually wonder whether simply putting the mountable side on the traffic lane side might have minimised many of the grumbles, whilst retaining the protective effect..
Do these cycleway separators do the trick? One of the frustrating aspects of this project has been the delay in getting the green colouring down. Yes, it always had green surfacing proposed for highlighting all the major crossings, transitions, and so on. I imagine that this would help to highlight those separator kerbs somewhat better too. In fact, I think that the overall finished product will look immensely better when it is installed. For budget reasons, the project was largely constrained to sticking with the existing kerb lines. However, the key to providing suitable cycleway facilities on Ilam Rd was the removal of car parking from one side of the street. This is always a contentious issue, especially in areas with high parking demand, but on future projects the conversation will no doubt need to be broached about the relative priority of parking vs cycleways (especially on arterial routes). The bus stops with their cycle bypasses behind have been an interesting feature (Fendalton Road also has similar facilities). In the main, I think they’ve worked well so far, with no major dramas between the various interacting road users. The new 40km/h speed limit seems to be supported by some preliminary speed surveys, with mean speeds tracking comfortably around this limit, especially in the northern section. The relatively narrow traffic lanes are no doubt contributing to this outcome. Hopefully this will encourage greater use of lower speed environments as another tool in providing for cycling around Christchurch. Interesting to see that many riders are using the new zebra crossing to help get across by University Drive – and motorists are stopping for them. Although technically not legal to cycle across such a crossing, perhaps this is a place to formally trial such an arrangement in NZ? The shared path on the western side has only seen minimal usage by people cycling, but it at least provides another option for the less confident riders (especially kids on their way to the nearby schools). The ongoing maintenance of these cycleways is another learning curve. The double kerbs make for a natural area for debris to congregate, and it’s a bit trickier for conventional street sweepers to get in there. In the near future we might see some special narrow sweepers in the Council’s maintenance fleet to deal with these. All up, there is plenty to learn. Yet, despite these “niggles”, my overall impression from talking to various people (particularly those who walk and cycle it) is that the project is generally a big improvement on what was available beforehand for active modes in this area. What do you think about the Ilam Road cycleway? What works? What doesn’t? I certainly hope that the design of Ilam Rd isn’t used elswhere as a standard design. I feel it would be a better design if the foot path were widened and included as cycleway all in one. it would use a lesser footprint of the road reserve. the shape and design of the separator kerb could then be modified to be more user friendly and better aesthetics. having the gaps as they are, many motorists seem to think that is their access for car parking. A continuous barrier with ramped sides would be better looking and more user friendly. Harakeke St has a variation offering a full cycle lane and does not offer the same level of confusion. Also if cyclists are to cross a road and use a pedestrian crossing, then they should walk their bikes across the road. A pedestrian crossing has certain legal status which offers protection to pedestrians only. A cyclist when riding a bike is not a pedestrian and the laws pertaining to a cyclist crossing the road is no different to other vehicles. Being adjacent to a University, one would think that the users would understand road rules and comply with them. Again I stress, Cyclists also need educating about riding on the road as there is no formal requirement or competency test to understand the road rules for cyclists. I’m quite disappointed with the Ilam Road cycleway, especially between Creyke Rd and the University. It seems like the quality of the lane was not considered during construction; the accumulation of debris as well as the steep, horizontal slope make riding challenging. Even at a slow speed, cycling two-abreast is very challenging in this lane. Designing cycle lanes for two-abreast riding is a no-brainer as the social aspect of a ride is very important! Especially with the emphasis on recreational urban cycling coinciding with commuting routes, I hope that quality is emphasized in the construction of our future bicycle routes so the paths are enjoyable to use. This is the way to attract more people to ride their bikes! I’ve probably said enough on this subject in previous post already. Mostly like the design, but don’t think much of the seperators. Would prefer a 50mm ramp then a row of pavers, then another 50mm ramp. Enough said. Just a note about the bus stops. I acually laid a complaint with ECAN and the police last week, because I’ve noticed that busses approaching from behind are routinely honking their horns at me while I’m passing the bus stops. I get the feeling the bus drivers are trying to get cyclists to go into the diversion all the time, rather than just to get around a parked bus. Hopefully the green markings will clear things up a bit, as might a bit of a reminder of the road rules from TransMetro to their drivers. Its good to see staff at the council saw fit to consider cycle safety here. In the Living G Yaldhurst mixed residential commercial zone, council staff permitted the developer to completely eliminat the required cycle lanes without any consultation forcing cyclists to share 3.2m travel lanes with buses, trucks and cars. Staff also permitted the elimination of the required turning median and recessed parking safety features making the roads even more dangerous. Hopefully the new Councillors will require these dangers to be remedied before the roads vest and casualties occur. The green surfacing is finally going down now! I agree. Main commuter roads (collector roads) should be designed with sufficient space for efficient motoring AND cycling. Christchurch City Council’s Infrastructure Design Standards (ISD2010) requires this but council staff have been ignoring these Standards and doing deals with developers to ELIMINATE cycle provision and CONGEST traffic including the elimination of right turn medians (such as in Living G Yaldhurst). hi, ive had two bad flats using ilam cycle way in the 6 months after work (allways carry an old tube), so not a big fan, the amount of junk and glass on the roads now is terrible, regular sweep would go a long way. 1) No warning about the cordoning off today due to further resurfacing! Almost cycled into the first set of barriers. 2) The areas where buses stops is an area of “conflict”. Routing the lane around the back of the bus stops is clumsy, I feel, and brings you into further conflict with pedestrians. 3) The surfacing episode, where they had to completely re-do a section, has been farcical. 4) Someone has already hit one of the concrete “separators” and damaged it. 2. The placement of the green paint seems to be rather arbitrary. 3. It’s not obvious whether cyclists going in either direction may use the western footpath. 4. The width of the cycle path suddenly changes in width. . Seems to me to be a case of trying to fit everything in too small a space. It might have been better to move the bus stops? Previous Previous post: What “Quick Wins” would you like?